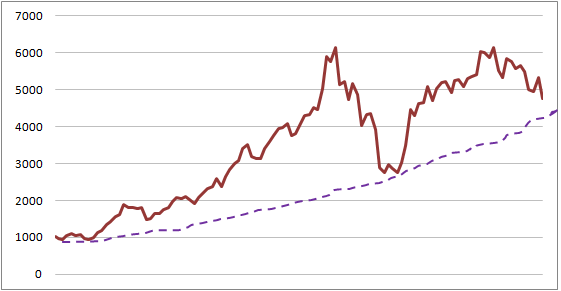 Here’s a hastily drawn chart which shows NIFTY monthly closing prices ever since Aug 2002. I have drawn the purple support (?) line rather arbitrarily, but via that it does look like the knife has some more height to fall. Lets not catch it and bloody our hands anymore than they already are! Was in search of such plain vanilla short term information. Thanks.